Do you often feel cooped up inside your home or office? The urge to feel the warmth of the sun and the cool breeze on your face becomes overwhelming. Getting outside into the fresh air can do a lot of good for a person. Next time you feel stressed or restless, get up and go outside. Take a brisk walk around the block or to the local park. Listen to the sounds around you. The birds chirping, the wind rustling the leaves, and the insects buzzing in the grass can be very calming sounds. Gazing at the sky, the plants, and the other beautiful sights of nature is similarly soothing. You’ll be amazed at what a walk through nature can do for your mind and body, even if you only take a few minutes out of your day to do so. Below, Ranger Mac will take a look at several reasons why you should start spending more time in nature. You can gain more from the experience than you might think! A study at the University of Michigan sent two sets of students out for a walk. Both groups of students took a test before the jaunt. Then one set took a walk around an arboretum and the other took a walk down the city street. The students were then given another test, and it showed that the group who took a walk among the trees had a 20% increase in cognition than when they took the test before the walk, while the city-walkers showed no such change. Another similar study took patients who were clinically depressed and found that walks in nature boosted their working memory much more than walks in urban areas. Other studies have shown an increase in creativity and sharper thinking after spending time in nature. By really concentrating on the sights and sounds of the natural world around you, it can help you clear your head for calmer and clearer thoughts, leading to sharper thinking and inspiration. Walking around in nature is a great way to boost your mood. If you’re in a funk that you just can’t seem to shake, dust off those hiking boots and hit the trail at your local park or nature preserve. Being surrounded by nature can help with self-reflection and give you some perspective. It may also help you better empathize with others around you. Research has shown that happier people do more activities outdoors rather than sitting inside every day. Next time you want to hit the gym, go for a hike outside instead. You might find that it puts you in a better mood! Known as ‘forest therapy,’ studies have shown that people who get out in nature have a lower level of cortisol (the hormone linked to high stress levels) and a reduced heart rate. These numbers were found by comparing patients who participated in the study and spent their time out in nature versus those who spent their time in the suburbs or the city. Not only can you help your overall health by building up some muscle and endurance as you hike, you’ll also lower your stress levels and have a lower resting heart rate! In one study, researchers asked elderly patients who suffered from inflammation and hypertension to spend a week at a forest retreat. Once the patients came back from the study, their symptoms were notably reduced. If you can reduce inflammation and high blood pressure, you will protect yourself from some very serious conditions, such as autoimmune disorders, cancer, and depression. Spending time in nature boosts your general immune system as well. 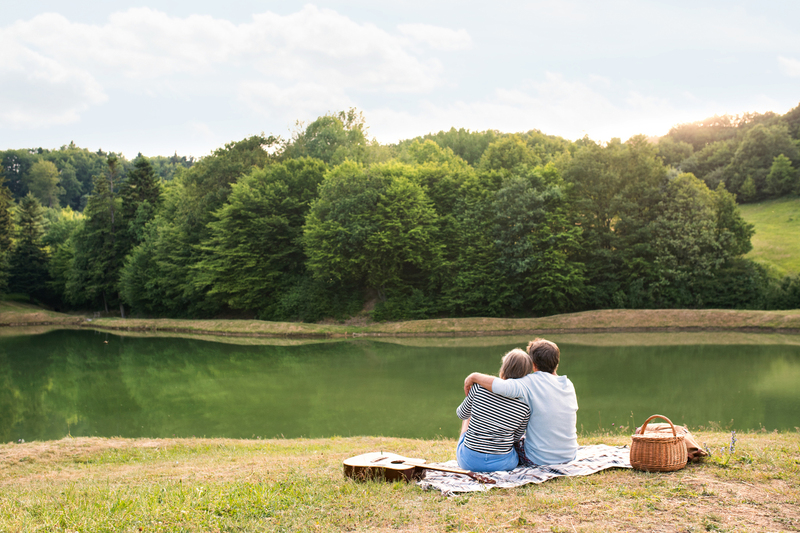 Relaxing in nature can help reduce your chances of catching that cold, flu, or other virus or infection that’s always spreading around. The research so far shows that people gain many beneficial effects on their immune function by spending time in a forest environment. Just like adults, there are times when children need to clear their heads. It’s been found that children who spend more time in nature have an easier time focusing and concentrating in a classroom environment. Experiencing nature also helps a child continue to develop his or her creativity and cultivates a drive to protect the world around them. Next time you feel like you need a walk in nature to clear your head, see if your kid wants to enjoy the scenery as well. It could be good for both of you! While more research needs to be done, the studies so far reveal that spending time in nature has many benefits. From strengthening your body to helping your brain function to relaxing your mind, a walk around your local green space or park can do you a lot of good. Lace up those walking shoes and hit those trails - your body and mind will thank you later! Not sure where to find a local park? Check out these resources available easily online!